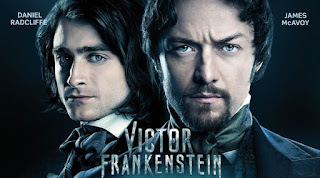 In this movie, James McAvoy plays Steve Jobs and Daniel Radcliffe plays Steve Wozniak. They struggle to figure out how Daniel can work out all the technical details of putting together the Macintosh to meet James' stunning vision that no one else thinks will work, but Daniel is so knee-deep in working through the specifics that he doesn't even bother to think about the greater picture of what they are trying to do. Now, take the Jobs/Woz names out and slap in Frankenstein and Igor. Replace the Mac with the monster, and you have the essence of these characters. First thing they do in the story (to make Igor relatable) is to remove the hunchback and straighten the spine so Daniel doesn't have to pretend to be anything other than the civilized and handsome young man that he is. As a bonus, they give him a backstory of being a circus freak who happened to also be the circus' doctor (without training, but he's really, really smart). Why make a comedy that isn't funny? I know, I ask that same question of all of the Adam Sandler movies that I've seen since Happy Gilmore, but why label this a comedy when it just isn't funny? I'm not even sure it was intended to be funny. It's a fictionalization of a documentary from some years ago that covers the 2002 Bolivian presidential election. I wouldn't call it a drama, and it's definitely not a thriller, but I sure as hell fire wouldn't call it a comedy. The foamy beer has a sticky head sitting atop a clear, light gold beverage. Lacing is very nice, and the aroma is light biscuits, a little grain, and a bit of citrus. It's a bit more indistinct than I had hoped, but it's not off-putting at all. I'm sure no brewer hopes for that sentence in a review, so I'm just going to move on. This review is going to have spoilers in it. I normally try to avoid them, but it's really kinda necessary to understand the massive problems with this movie - mind you, it's not ALL problems, but there are enough that they need to be called out. There's your warning. Evil Twin, stop jerking me around. You put out some excellent beers, and then you put out some kinda crappy beers. You need to get your stuff together and start producing at a professional level. I'm starting to get the feeling that you are just a hipster beer company that is more concerned with the names of your beers than the flavors that go into them. I'm just about at my breaking point with you. The beer is deep, dark, and distressingly brown. very quickly, there is nearly no head - just a ring of bubbles around the top of the beer, clinging to the wall of the glass. The aroma is very sweet malt and smoke. 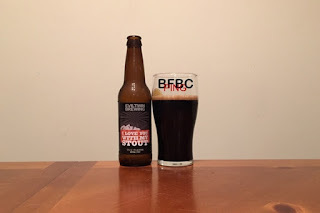 The malt is so sweet that it highlights the chocolate and makes the beer smell very crisp. You may recall, I didn't particularly like the first iteration of this franchise. 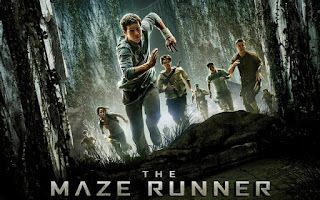 This series really borrows too much from the Hunger Games, and the things it does to try and set itself apart ultimately make it less of an enjoyable experience. The simplistic five category separations of personality that this world has created and relies on is cumbersome at best. But that's just the setup for this movie, and we have to give Insurgent its own chance. One of my friends from college responded to that last review, and he made some good points in favor of the series. The problem is, I think he was more informed by the books then he was by the movie. It's entirely possible the books are vastly superior to the movie franchise, but I'm only going off of the movie. 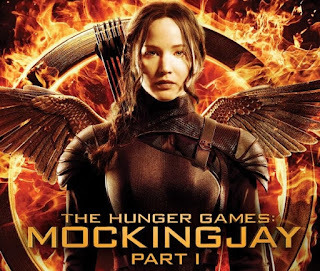 Maybe the books explain away the fact that these divergents are seemingly very commonplace – to the point that they could probably be their own sect – and yet are still persecuted by the ruling class. 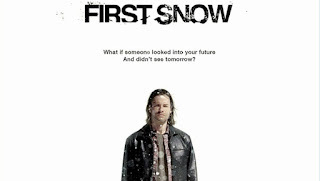 Not sure why I am drawn to these movies, but here we have another movie where we enter at the same time as the protagonist with no real idea what is going on or why. She's trapped in a room where she has no interaction with anyone until something bad happens, and she has to instinctively react. This is an exploitation film - it really feels like it belongs in a different era, but it was released in 2013. 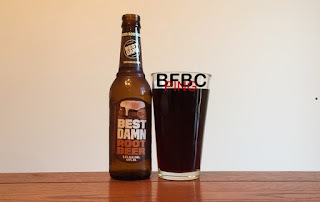 The Hard Root Beers I have tried so far have been god awful, pretty good, and pretty damn good. This purports to be the best damn root beer, and I'm willing to give it a chance. I like the idea of these little boutique beverages that are brewed for the pleasure. I treat them like someone might treat the oddly named concoctions that a skilled bartender develops - they are curiosities that might yield something delicious. It's the color... of root beer. Who'd have thought that they would hit the color that they were looking for just like the previous three hard root beers? Well, it turns out you can get anywhere you want with the right color dye. It has no head at all. I expect root beer to have a thick, sturdy head on it, but none of these hard root beers seem to have been able to duplicate that. The aroma is definitely root beer, but it also smells a bit malty. I'm not sure that's a good thing, but you can only divine so much from a smell. This movie deals with the fallout from the last movie. The most recent hunger games have ended, and our hero has been whisked away to some strange new place by Diane Lane and Philip Seymour Hoffman. Diane is the least charismatic president ever to hold office. I have no idea what the process was for making her president, but it can't be part of any political system I've ever seen. She doesn't even seem aggressive enough to have simply arrested power from the people. But, she's the generally ineffectual president who makes the tough calls in this war that district 13 is having against the capital. Imagine if you went into the Amityville Horror knowing that Ouija boards were a terrible idea. The kids in this movie have no illusions about whether or not they should be using a Ouija board, but they go ahead and use them anyway. In the real world, it wouldn't make any difference, but these people are in a movie! If you look around and notice that you're in a movie, just put the Ouija board down and walk away. While I'm not a scientist, I am definitely a fan of quantum physics. As a result, I was really looking forward to this movie. 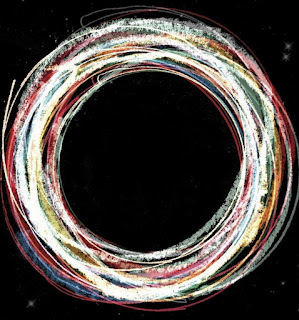 This was essentially supposed to be a dumbing down of what the Large Hadron Collider does, who the people are that are using it, and its significance in the universe (or our understanding of it). 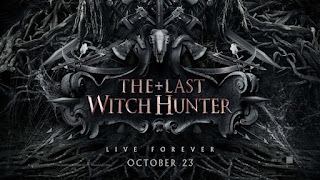 This movie appears to have gotten overwhelmingly positive reviews from every place I've looked, so there's no reason for me to not be nuts about it. This is a story about loss and redemption. 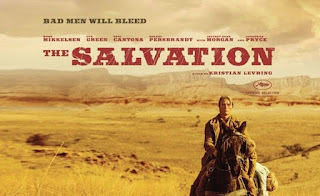 This is not your standard Western, but it also manages to grab the wild essence of traditional Westerns and mold them into a new, fresh take on what it might have been like for at least one man in the Wild West. If you don't feel anything for the characters by the end of the movie, you may just be dead inside. Kodi Smit-McPhee plays a very young man who is following after his girlfriend from back in Scotland and her father out of pure love. He is positively smitten with her, and he has a very single-minded focus on finding her and making her his. 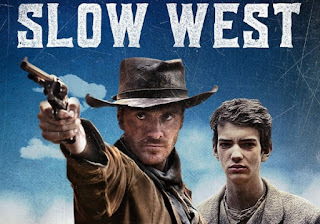 He is clearly unprepared to deal with the dangers of the Wild West, and consequently makes a very, very slow progress West; hence the name Slow West. His innocence coupled with his forthright mannerisms make his character lovable in his portrayal is absolutely fantastic. 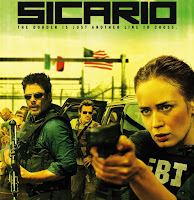 So, the movie starts off by explaining that sicario means "hitman" in Mexico. Mind you, they don't say in Spanish, they say in Mexico, so I guess it's a colloquialism. I'd suggest they just call the movie "Hitman" or maybe "Mexican Hitman," but the movie isn't actually about a Mexican hitman... or even a hitman, really. It's mostly about someone who isn't even the right gender, but she also isn't a hitwoman (or hitperson). Scott Eastwood is the son of legendary filmmaker Clint Eastwood. The last Scott Eastwood movie I saw was not particularly good. It did not bode well for this one, however this one also had Walton Goggins and it, and I love that guy. So, how was this Western going to hammer out? Was it going to be a pale rendition of something Clint would have done, or was it going to break new ground? I was genuinely eager to find out. We start this movie off knee-deep in the action. Scott's house is already on fire, people are firing their guns at the house, and the darkened figure of Scott confidently strides out the front door and engages the enemy with seemingly not a single thought about his own safety at all. The entire scene is meant to inspire awe in this brand-new character, but it honestly comes off as pretty hokey. I immediately wondered what I just got myself into. It really had the makings of a terrible low-budget Western. I always seem to like movies that Guy Pearce is in. From the unexpectedly good Lockout where he essentially plays a space version of Bruce Willis in Die Hard to the uptight and evil lawman that he plays in Lawless to the driven entrepreneur and fitness not that he plays in Results, Guy really manages to fit into the mold of whatever the character needs. He doesn't just bring the same character to every role and hope that it fits, and that's what I like about him. 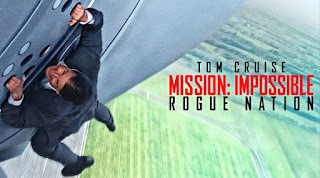 I have liked all of the Mission: Impossible movies so far to some degree. Maybe I'm just being taken in by the expensive special-effects, the slick camera work, or I'm just impressed with the way that they manage to make Tom Cruise look way taller than he actually is. I know the stunts are really spectacular in most of these movies, and the reason they are is usually because Tom actually does his own stunts with limited CG help. This movie is no exception to that rule. There isn't really much to say about Tom Cruise in this movie. He pretty much plays the same character, runs into similar issues, and gets out of them with alacrity and cunning. From that perspective, the movie is written pretty well. With the spy movies, you have to stick your hero in bad positions, make him do odd things, and eventually come out on top. Well, that's exactly what happens in this movie. I don't think anyone is surprised. 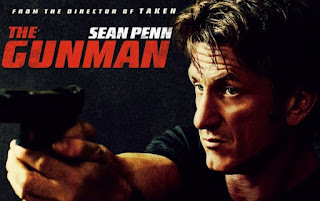 Before he went down to interview El Chapo, I saw this movie starring Sean Penn. I don't recall the last time I saw something starring Penn, and this was from the director of Taken, so I expected there to be some decent action in the movie. With as generally nuts and full of himself as Sean is, I didn't expect much from the acting. I'm not even sure I expected all that much from the action, now that I reflect on it. Luc Besson has made some very entertaining movies. Besides the Transporter series, he's done the Taken series, and some very good standalone movies like The Homesman, 3 Days to Kill, and Lockout. So, it's not like he doesn't have lots of ideas that can wind up getting turned into movies. Why would he feel the need to go back and reboot one of his own movie franchises? This series hasn't exactly gotten better with each movie, and at some point you just have to let it die. I don't know if Statham decided that he didn't want to do another transporter movie or something like that, but rebooting it by putting a guy in the same role with the same name and telling him to do his best Jason Statham impression cannot result in a success. I went into this movie in a way that was probably unfair for the movie. Much like The Martian, I was familiar with the canon around Hitman. 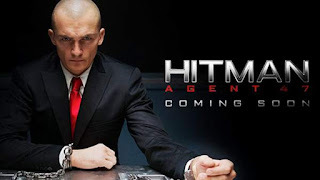 I think I played all the games as they came out, and I even saw the previous Hitman movie. That previous movie, starring Timothy Olyphant, was actually written by the same guy who wrote this one. But this is a total reboot, and it's just as well, as the first movie was really not that good. In the titular role of the hitman we get Rupert Friend, who I only remember from the TV show Homeland. The problem is, this is a really hard role to play. I know people like Statham make it look easy to be a sociopathic killer with a heart of gold, but not everyone can pull it off. For heaven sake, Timothy Olyphant is an excellent actor and he couldn't pull it off for the other film. Rupert tries hard, and he does an okay job. Although, not everyone's intended to ever have a shaved head. This is a Western. I know I had recently thought that there weren't really any good westerns lately, but then we had one after another. As a Western, this is also a revenge movie, so it has the makings of a damn good movie, even if the lead character doesn't speak English as his native tongue. Fact is, this makes sense, as many of the people who went west didn't speak English as their first language. Mads Mikkelsen is the Danish man who has settled some hunk of land and is now ready for his wife and child (who doesn't know him) to come out and live the American Dream with him. So, everything is sparkles and dandelions as far as the eye can see, right? Well, life can't be so easy in the hardtack Wild West, so he comes into a bit of a confrontation with a couple of no-good jerks who inevitably do something disastrous to our hero's family. 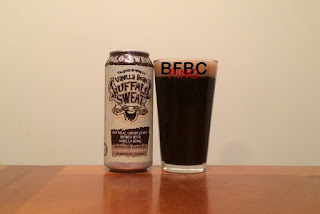 So, I really enjoyed the last Buffalo sweat oatmeal cream Stout that I had, and it looks like they just added vanilla to this one. I'm fine with that. Maybe the vanilla will kind of cut the coffee taste a bit – I have repeatedly pointed out that I'm not a fan of coffee – to make it a more pleasant experience overall for me. Honestly though, if they just match how much I liked the previous incarnation of this beverage, it'll be worth trying today. The head is very tan. I think it's darker than the one that didn't have the no added, and I can't really figure out why. The beer itself is the same colored deep, deep brown, and I find that shade particularly alluring. I lean into smell, and I can't really pick out the vanilla. I can still smell the smoke you would, and the kind of burnt oatmeal and coffee, but the vanilla appears to be too light for me to smell. Maybe my nose just as insensitive enough. I like Amy Schumer, and it's like this part was simply written for her. It probably seems that way because she wrote it, and she wrote it so that she would star in it. She then roped in Judd Apatow into directing it for her, and she got quite a few big names to show up in it. 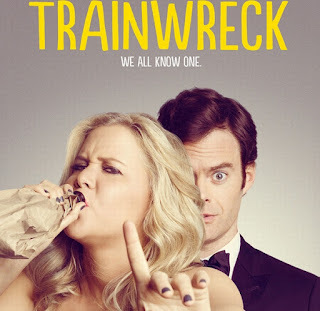 So, it seems that she had a recipe for success that couldn't be derailed, even if the movie was named trainwreck. Amy plays a character named Amy who is the embodiment of Amy's comedy. I suspect Amy isn't actually everything she claims to be on stage, but this character is a woman who gets drunk, gets high, has lots of one night stands, and is really pretty directionless in life. 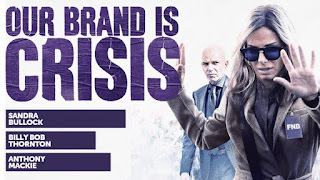 Ostensibly, she has a career as a writer for some trashy magazine where her hellish boss (Tilda Swinton) mistakes rapid decision making for leadership, but that's just the platform for the movie. So, we start with a roll of actors that is quite the draw: Vin Diesel, Rose Leslie (of Game of Thrones fame), Elijah Wood, and Michael Caine. Of these bunch, I think Michael Caine is the most surprising one in the movie, but I'm getting ahead of myself. This movie is not the sum of its credentials. Instead, it is substantially less than the effort and talent that went into it.